Is a Frost Point Hygrometer developed by the Laboratoire de Meteorologie Dynamique (LMD) of France in the late 80's for make "in situ" measurements of the contents of water vapor in the stratosphere. The weak water vapor contents, and the surrounding atmospheric conditions make this kind of measure very difficult and also its necessary to take many precautions to avoid pollution from the balloon and from the payload. ELHYSA works by the so called chilled mirror technique, in wich the air enters the instrument and circulates over a cooled mirror. The occurrence of dew or white frost is detected in an optical way and the temperature of the mirror is maintained at the temperature of condensation by a feedback loop controlling the cooling and the heating of the mirror using a thermoelectric Peltier device. This temperature, the dew or frost point temperature is directly connected to the partial pressure of water vapor that characterizes the water vapor content of the atmosphere. The simultaneous measurement of the air pressure and air temperature allows the determination of the mixing ratio and the relative humidity. The use of the Peltier module, provides an autonomous instrument which can be used on long duration balloon flights. However the cooling efficiency of it is strongly dependent on the temperature of the heat sink which is connected to the "hot side" of the module. 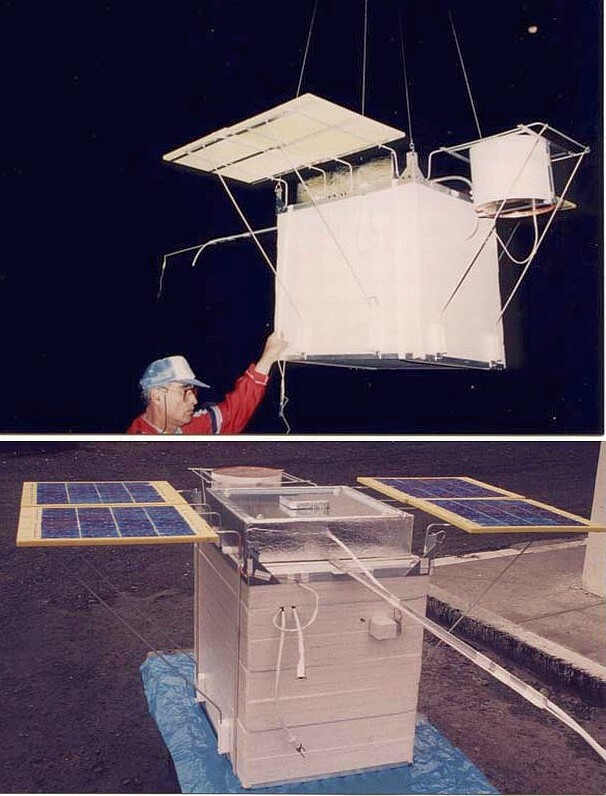 So, for the long duration flights, CNES developed, a special heat sink composed of a flat metal plate looking upward to the sky, as can be seen in the left image (click to enlarge) so that the instrument is cooled quickly when the sun lays down. This version of ELHYSA was used in short duration balloon flights until 1993 and in long duration flights -under MIR balloons- until 1996. In later versions the Peltier device was replaced by a system of cooling using liquid nitrogen. Campaign: Pre-AMETHYSTE (Application des Mir à l'ETude de l'HYgrométrie STratosphériquE) devoted to the water vapor measurements in the equatorial stratosphere by using the frost point hygrometer onboard MIR long duration balloons.